Silver Dolphin Books has published the equivalent of a coffee table book for the elementary crowd. 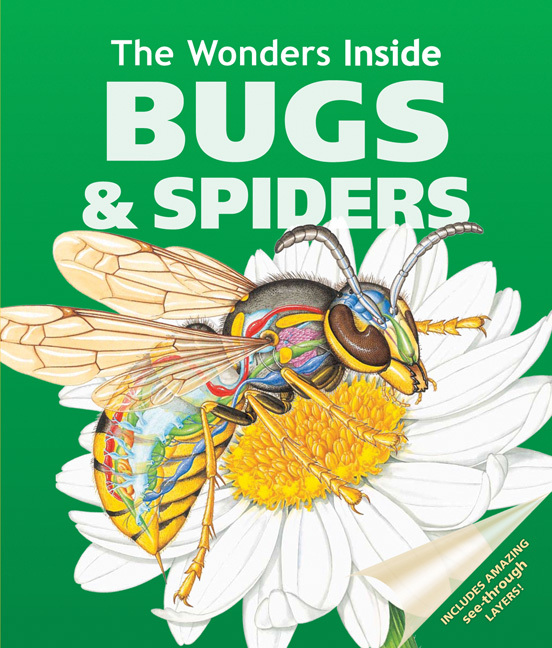 The Wonders Inside: Bugs and Spiders is gigantic, glossy, and gorgeous. Featuring see-through plastic overlays and realistic illustrations, the book teaches kids about metamorphosis, predator-prey relationships, and the anatomical structure of some of the most common kinds of insects and spiders. Given how bugs are reviled in our culture, it’s nice to see a book that discusses their natural histories without playing up the “yuck” factor. My only criticism of this book, from a vegan perspective, is that its focus on who eats whom seems a little much at times. I’d be interested to learn more about cooperative relationships among bugs and spiders — whether within a hive, or via cross-species symbiosis.